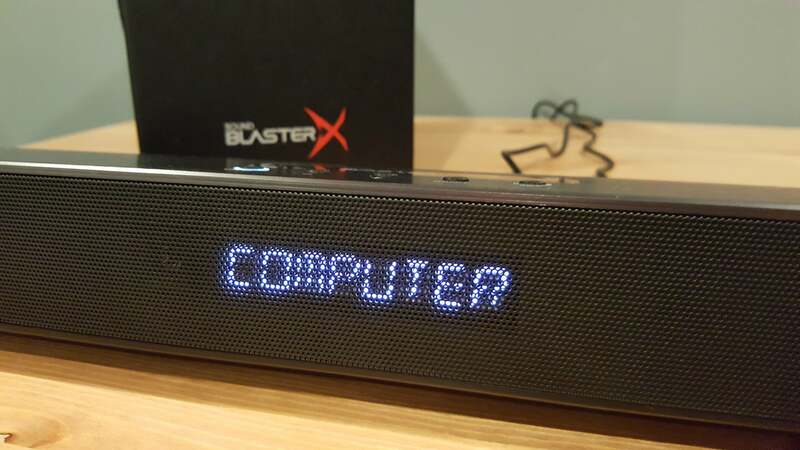 Big sound, small form factor, and one eye-popping price tag. 1) Unlike TVs, monitors rarely ever come with built-in speakers. 2) Most dedicated PC speakers are terrible. 3) Desk space is often in short supply, and cable routing a pain. But for some reason the soundbar hasn’t made its way to desktop PCs, even as it’s become a hit with everyone else. Razer sort-of made an attempt with its Leviathan a few years ago, but even that was more geared towards the living room. 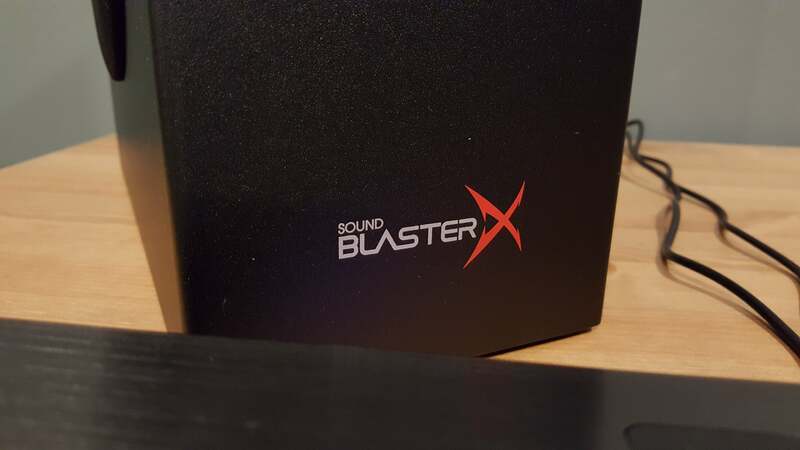 So Creative isn’t stretching the truth too far when it calls its new Sound BlasterX Katana the first “Under-Monitor Audio System.” Sure, you could still use it in your living room—it’s got all the necessary inputs, and it gets damn loud (more on that later). The Katana is meant for desks though. At two feet long and a mere three inches tall, its slim profile fits comfortably under your monitor whether it’s on a stand or a movable arm. It’s a particularly good fit on a 24-inch monitor, with the tweeters lining up almost perfectly with the corners of my own panel. But really, anything up to around 35 inches will work fine. Anything bigger—like, say, a TV—and it’d look a bit small and silly. 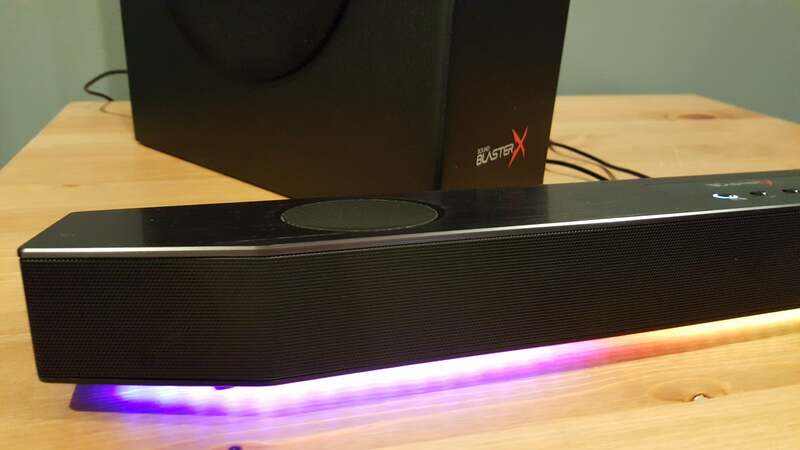 Aside from its relatively diminutive size, it’s a pretty standard soundbar design—black grill on the front, housed in a brushed-aluminum chassis. An LED panel on the front gives you rudimentary control of the Katana, with five buttons spanning the top: Power, Volume Down, Up, Source, and the “SBX” button that cycles between various preset profiles. The nearby Sound BlasterX logo is a bit of an eyesore, very video game-centric in its aesthetic on a device that’s otherwise sleek and high-end looking. Given it’s on the top and towards the rear though, you’ll rarely notice it. On the back are a dozen or so hookups: MicroUSB for your PC, regular USB for thumbdrives or whatever, optical, 3.5mm, and more. There’s also Bluetooth capability if you want it. Notably absent is HDMI, which is a bit strange in this day and age but probably not a big deal for PC users. There are five drivers total, with two tweeters along the facing edge, two mid-bass drivers pushing audio up from the top, and a separate subwoofer unit meant to go under your desk. The subwoofer is passive, just a nondescript black box approximately five inches wide, a foot tall and a foot deep, connected by a single cable. Shove it out of the way or use it as a footrest. Rounding out the hardware is a remote control with the ability to Play/Pause, adjust volume and EQ, and cycle through lighting schemes, sources, or audio presets. It’s a cheap bit of kit, but works fine when you’re too lazy to reach up and hit one of the buttons on the bar itself (or if you plan to use the Katana in the living room). I’ll also note that the power cable on the Katana is a bit short. It should be fine for normal purposes, but I’ve taken to testing every device with my sit/stand adjustable desk, and while the Katana can be used in the standing position the cord just barely reaches—and my power strip sits directly beneath my desk. Something to note, if you’re either a sit/stand or stand-all-day type of person. Before we even get into a discussion of sound quality, let’s talk sound quantity. By which I again mean to say the Katana is loud. Not just loud. Deafening. Rated for 75W RMS, the Katana is a bit much for my apartment and could easily fill a much larger room. The volume steps from 1 to 50, but I’ve kept it around 10 for most of my testing—20 if I really wanted to get loud. A confession: I haven’t managed to push it over 25 yet because it felt like the Katana was punching holes in my eardrums from two feet away. If you want to blast this thing at full power, make sure you don’t have neighbors. Or are partially deaf already. And besides, it sounds better in the 10 to 20 range anyway. Go much higher and the subwoofer has a harder time keeping up, resulting in noticeably tinny audio as the upper range outpaces the lower. Even at more listenable volumes, the Katana is a bit treble-heavy. Out of the box it has that “radio” sound I associate with smaller speakers, especially computer speakers. A bit of EQing goes a long way though. Creative’s default “Concert” setting is a good place to start, boosting the low end in particular and rolling off some of the harsher tones. 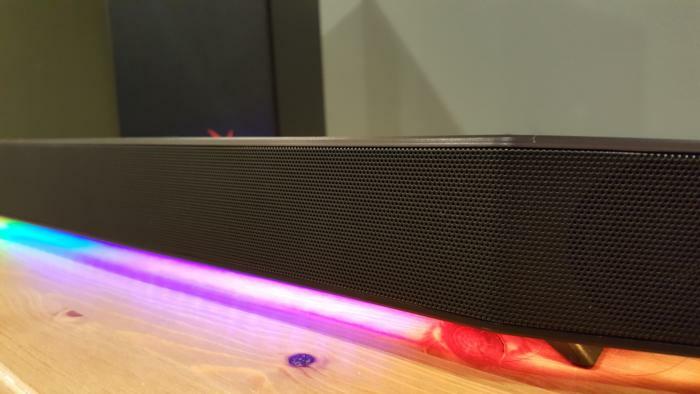 From there, you can set to taste—there’s a lot of headroom to experiment with, and you can get surprisingly good audio out of the Katana considering it’s a soundbar. Definitely better than your average pair of computer speakers. I also suggest setting the “Immersion” dial in Creative’s software to “Ultra Wide.” It makes the Katana sound less like a two-foot-wide soundbar and more like a broad array of speakers. Creative actually claims the Katana supports Virtual 7.1 when connected by USB, though as with headsets, it’s more a crude approximation of surround. 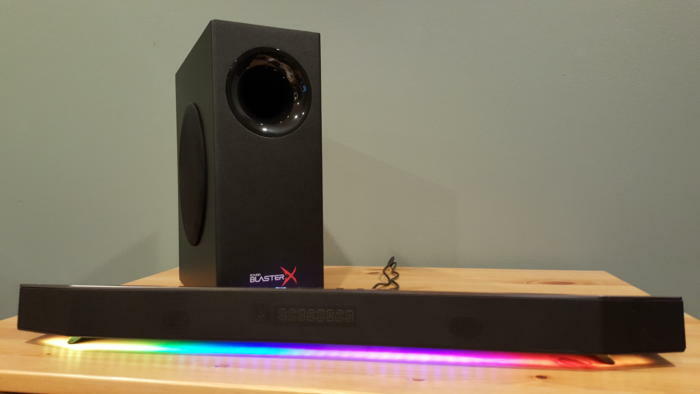 Listen: Does it measure up to an actual set of speakers? Not really. The Katana is impressive, but toggling back and forth between it and my standard JBL LSR305 studio monitor setup, I still prefer the latter. Two discrete speakers give me more control, plus the LSR305 setup definitely has richer audio (even without a subwoofer) and a wider soundstage, no tweaking necessary. On the other hand, the LSR305 takes up a huge amount of space and costs $300 a pair—plus the cost of an audio interface to power them. (I use a Scarlett 2i2, for reference.) 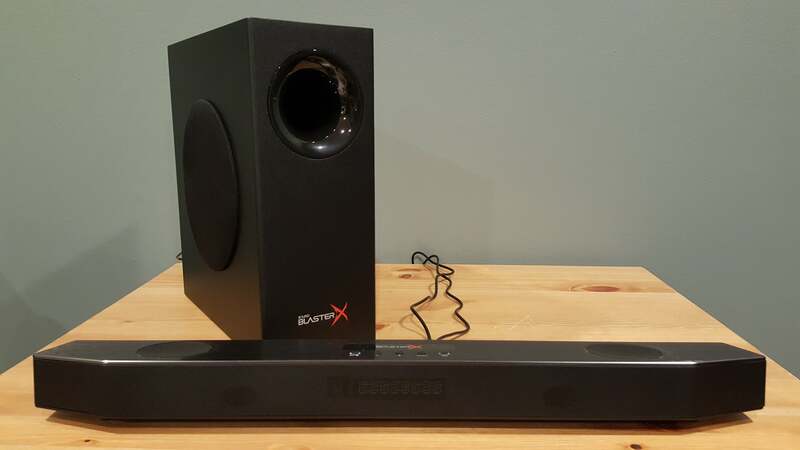 The Katana may seem expensive at $300, given most PC speakers are around $100 a pair, but it sounds pretty damn fantastic, takes up only a smidgen of desk real estate, includes a sound card if you want to use a headset or headphones (3.5mm only) with something better than your motherboard’s onboard audio, and puts on a pretty light show while it’s at it. We’re in the era of RGB-everything, so of course the Katana also lights up. A string of 49 RGB LEDs is arrayed alongside the bottom of the Katana, reflecting off your desk and putting on a miniature light show. It’s hokey, but then so is everything else RGB. And hey, at least you’ll see these lights—it’s not like headsets, where they’re purely for other people’s benefit. There are a few presets available out the box, including a rainbow wave, a dim yellow mood light, and a pale white band that bounces back and forth. Download Creative’s software and you’ll gain access to more customization options, with the bar split into seven groups of seven LEDs. Create your own setup and you can save it to the Katana’s onboard memory, making it available even if you change computers, uninstall the software, or move it to your living room. The software’s fairly foolproof, though I’m a bit sad Creative didn’t take advantage of seemingly obvious customization capabilities. For instance, there’s a beats-per-minute (BPM) counter built in to speed up or slow down animations, but no way to sync the lights to your music. Nor is there any sort of “Visualizer” type display available. It’s software, so there’s a chance Creative gets around to adding those in the future. Still, you’d think those options would be there at launch. Not a bad deal, really. If you’ve already got a great set of speakers, there’s no reason to rush out and upgrade. Still, the PC seems ripe for soundbars to take over, and Creative’s put itself in a good position by being first to say, “Yes, this is for desktops.” Now let’s see how long it takes for everyone else to *ahem* “take inspiration” from Creative’s example. Tired of all the clutter on your desk? 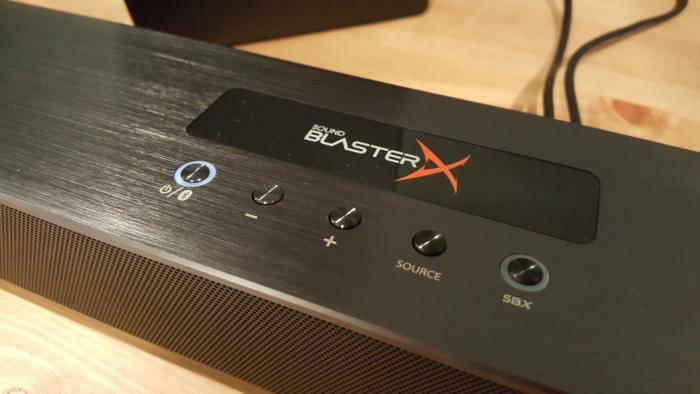 Creative's Sound BlasterX Katana brings the soundbar to the PC. Big sound, small form factor, and one eye-popping price tag.